The hot summer months are coming, and in Tampa Bay and its surrounding Florida regions, that’s no joke. It’s hot enough as it is when it’s not summer, but now that the hottest months are approaching, you really can’t afford to have an air conditioner that’s in anything less than optimal condition. Unfortunately, a lot of people take a “never tell me the odds” attitude when it comes to their air conditioning system, assuming that the statistics of air conditioner repair just don’t apply to them. This leads to continual neglect, general ignorance about the workings of their system, and inevitably, breakdowns — or at least bogged down function that makes your system more costly and less efficient. If your air conditioner has problems, it’s always a good idea to call the professionals instead of resorting to DIY solutions. However, there is one thing you can do at home that’s cheap, easy, and has a measurable impact on your AC system: replacing your air filter. Here are some reasons why doing this simple task is immensely beneficial for your home and health. Though it’s hard to notice, the quality of air indoors is significantly worse (in most cases) than what is outside. This is one reason why you can feel the “fresh air” whenever you step out — the air is literally healthier and cleaner. Your air filter, essentially, acts like a strainer that keeps bad pollutants and air particles out of your home. The air that flows through your HVAC has to pass through this gateway, and it catches everything it can, leading to better quality air. However, after a while, the gunk builds up. This ends up blocking a lot of airflow, making your system work harder (thus increasing your bill). Not only that, it’s easier for pollutants to break through under these conditions, overall decreasing the air quality in your home. This is not only unpleasant, but it can be hazardous to your health in the long run. The bad news is that you’ll want to replace your air filter once a month if you want your air conditioning system to be as efficient as possible. The good news is that this routine task is not only extremely easy, it’s also affordable. You can find air filters at your local general department store for $10 – $20, and replacing them is as easy as finding out where your old filter is (usually somewhere that’s readily accessible), sliding it out, and putting the new one in. It takes minutes at most, and prevents a whole slew of problems that could potentially affect your AC down the line. If your air conditioner is need of repair, the best thing to do is always to call the professionals, but we encourage you, in the meantime, to keep an eye on your air filter, because it truly can make a tremendous difference that can be felt in the home. If it’s something you’ve never done before and you’re looking for some professional consultation, no worries! 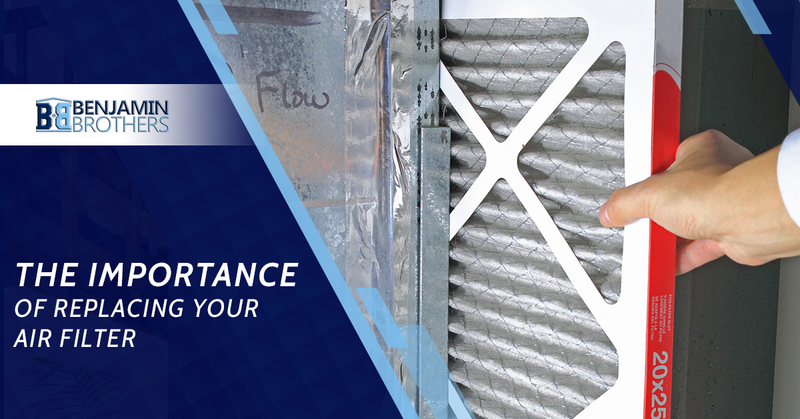 We would be happy to stop by, perform a checkup on your air conditioner system, and teach you the basics of how you can service the air filter on your own time. Benjamin Brothers has been serving the people of Pasco County, Hillsborough County, and Tampa Bay for years. Contact us today!